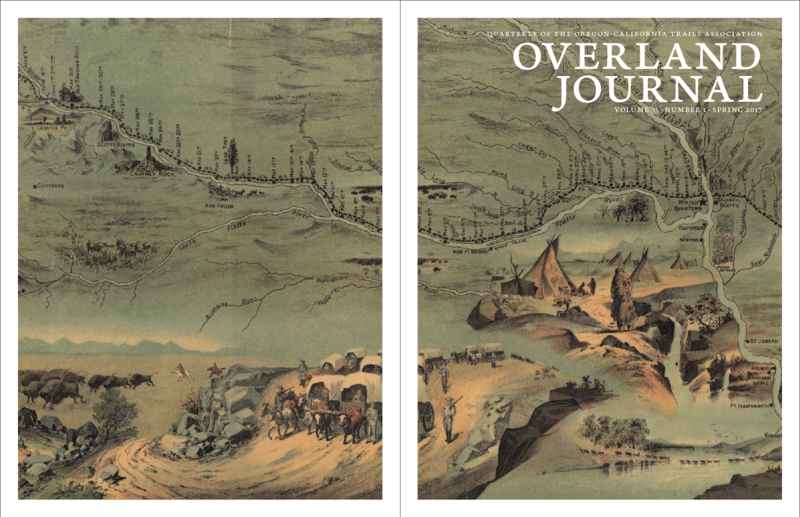 I’ve been saving this image for years, just waiting for the right Overland Journal to come along. 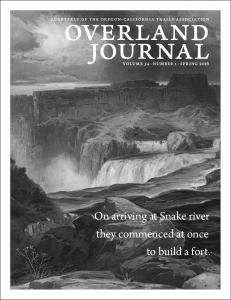 The focus of the spring issue is Council Bluffs, Iowa, the site of the upcoming annual conference, but none of the articles specifically discussed the Mormons, whose Winter Quarters were situated right across the river. This map, showing the Mormon Trail from Illinois to Utah, worked perfectly for this edition in multiple ways. 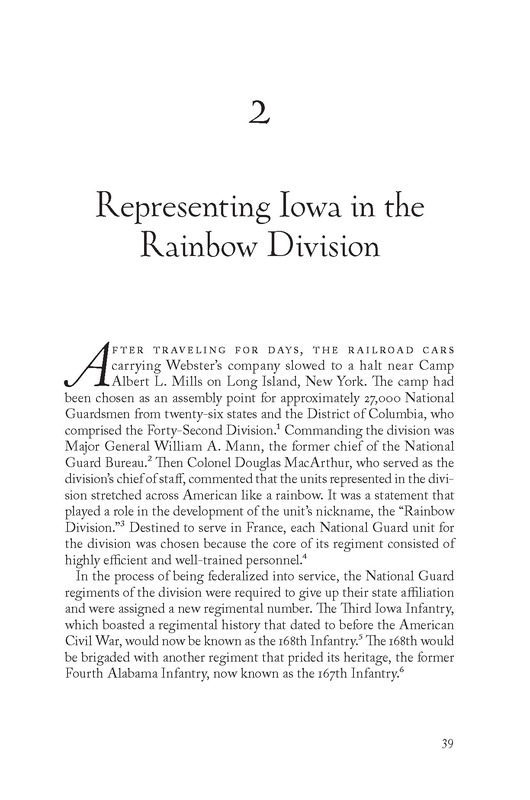 Second, we were able to run the full image inside the text, accompanying a reprint of “The Council Bluffs Road,” an article by trail historian Merrill Mattes. Mormons and the Mormon Trail are one of the topics of the article, so it beautifully illustrated his points, stretching across the two-page spread. Finally, we hadn’t run a map on the cover in years, which Marlene, my editor-in-chief, and I both wanted to do. Voilà: a perfect image! I just love how it turned out. On the cover: Detail of Route of the Mormon Pioneers from Nauvoo to Salt Lake City, Feb’y 1846–July 1847. Printed by Millroy & Hayes. Salt Lake City, c1899. 28 × 100 cm. For the full map, see Library of Congress, Geography and Map Division, https://www.loc.gov/item/gm69002272. While archiving some files the other day, I remembered a few projects that I hadn’t written about last year. 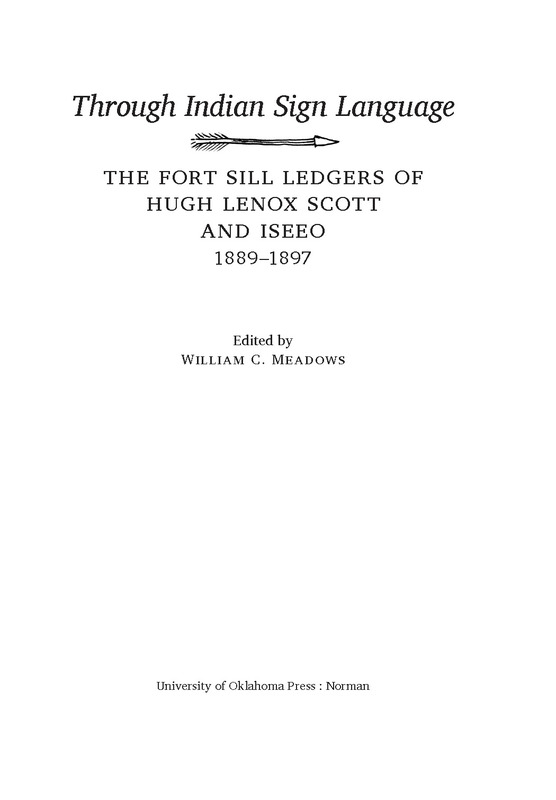 The first one is the design for Through Indian Sign Language: The Fort Sill Ledgers of Hugh Lenox Scott and Isseo, 1889–1897, edited by William C. Meadows. Shown on the page on the left, the arrow sketch (taken from one of the illustrations) is a design element throughout. 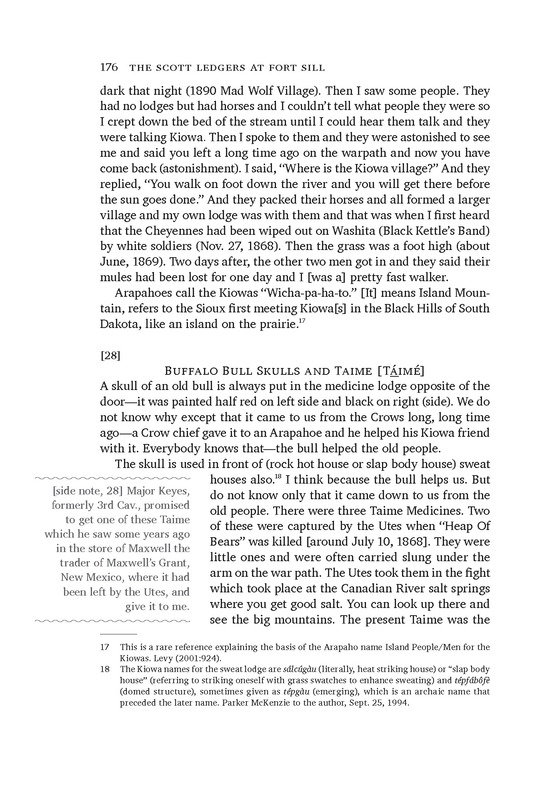 This project was a little different because of the way the author wanted to call out some notes, shown on the image to the right. The wavy line was inspired by a different arrow sketch, which had a wavy line running down the middle. It was complicated to lay out, but the final project turned out very nice! We also had to use a different typeface than usual, because the text required many glyphs that were only found in this one, which was designed with phonetic symbols. 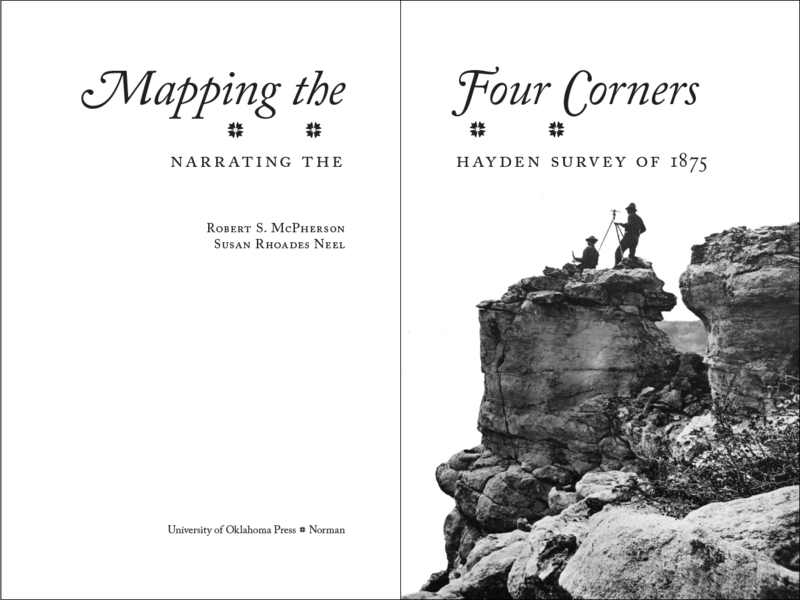 I just loved how this title page for Mapping the Four Corners: Narrating the Hayden Survey of 1875, by Robert S. McPherson and Susan Rhoades Neel, turned out! It is nice to use the full page spread—emblematic of the wide scope of the survey—for a change. The image was just dynamite, with the silhouettes of the surveyors on top of the cliffs. I also chose the four-piece ornament because it literally had four corners meeting up in the center! 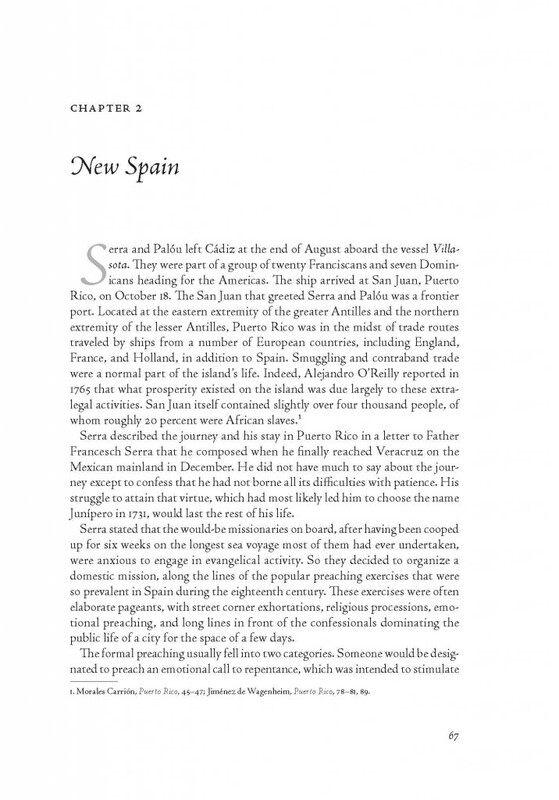 Here is a page from Somewhere Over There: The Letters, Diary, and Artwork of a World War I Corporal, by Francis H. Webster and edited by Darrek D. Orwig. The time frame of this book is much later than my usual topic, and I wanted the display type to be a little bit special for a book about an artist. I chose Oneleigh because it had some flourishes to make it look distinctive but was not too full of flourishes. Also the way the ‘g’ was drawn was similar to how the author wrote the ‘f’ in his name on his cartoons. This book has a color section showing some of Webster’s artwork; they are stunning! 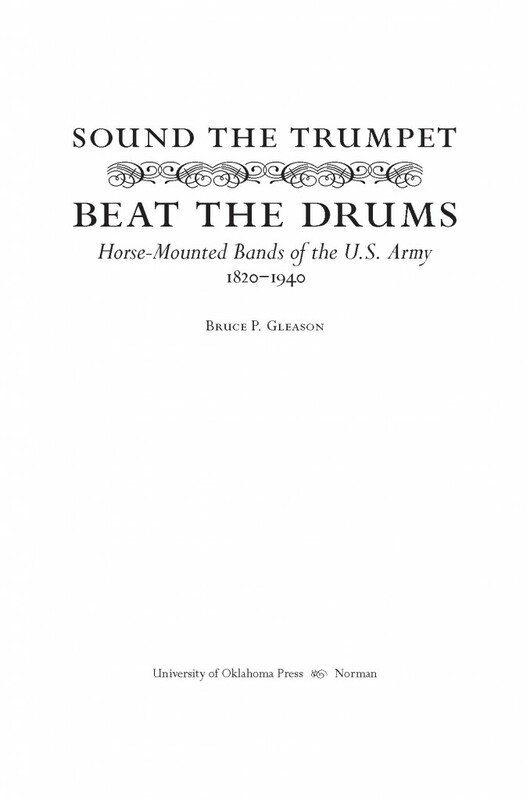 Another title page with ornaments (this one for Sound the Trumpet, Beat the Drums: Horse-Mounted Bands of the U.S. Army, 1820–1940, by Bruce P. Gleason), which the production manager at OU Press declared to be lyres—how perfect for a music book! Linking them up into that long row reminded me of the lines drawn for music notes. 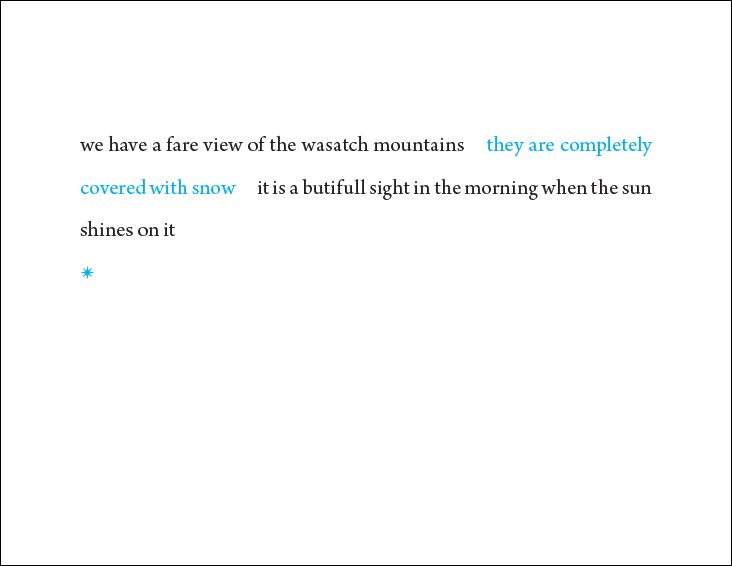 This year’s Christmas card quote came from a diary of a pioneer in Overland Journal this spring; it reminded me of early mornings on the ski hill. Here is a look back at 2015′s card and 2014′s. from Robert E. Davis, Following Sarah: Sarah Davis’s 1849–1850 Journey from Michigan to California (Twentynine Palms, Calif.: Quiet Creek Corporation, 2013), 71, in Robert E. Davis, “A Trek from Thomas Fork to Hastings Cutoff along the Bear River, 1850,” Overland Journal 34, no. 2 (Summer 2016): 54. Yikes! I can’t believe it’s been so long since I last updated. Here are few things I’ve been working on. 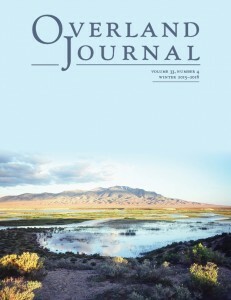 I continue to be proud of the new design for Overland Journal—it even inspired another quarterly to take on a new look! Here is the Fall cover. This issue had an article by William P. MacKinnon, author of At Sword’s Point, Part 2: A Documentary History of the Utah War, 1858–1859. I copyedited and designed this giant (698 pages) in 2016 (I worked on part 1 in 2008), and his article was a couple of great extracts from the book: anecdotes about real life during the war. 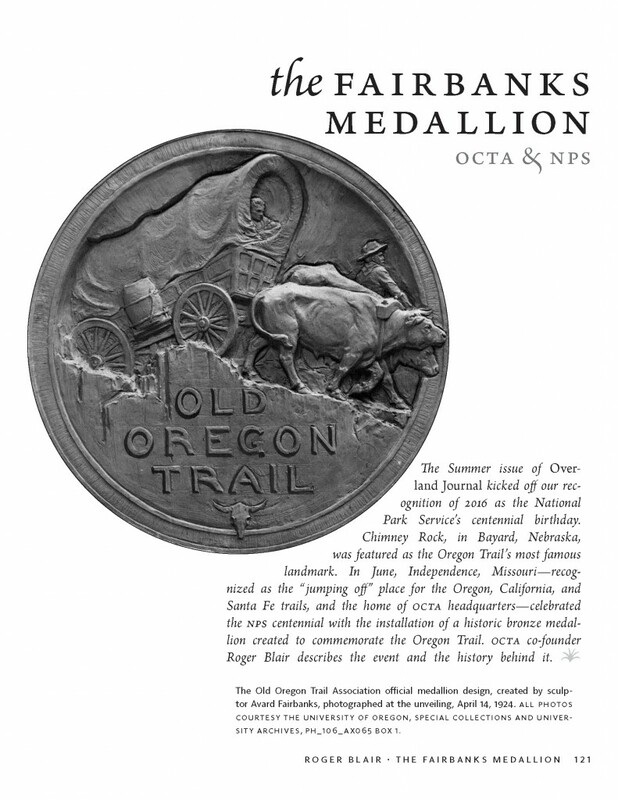 Another article in the Fall issue was on the design medallions that mark the Oregon Trail, also shown on the cover. Besides the fact that I love the layout on this page, it’s also a good example of the contrast between color and black and white—on the cover, we show the medallion in its place in the world, but the starker black and white shows the great detail in the sculpture. 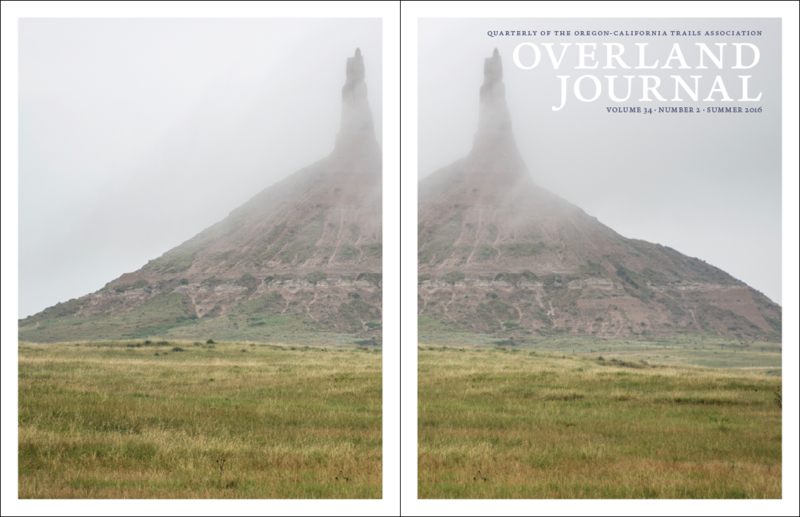 Working backward, here is the Summer cover of Overland Journal. Chimney Rock, July 21, 2015. 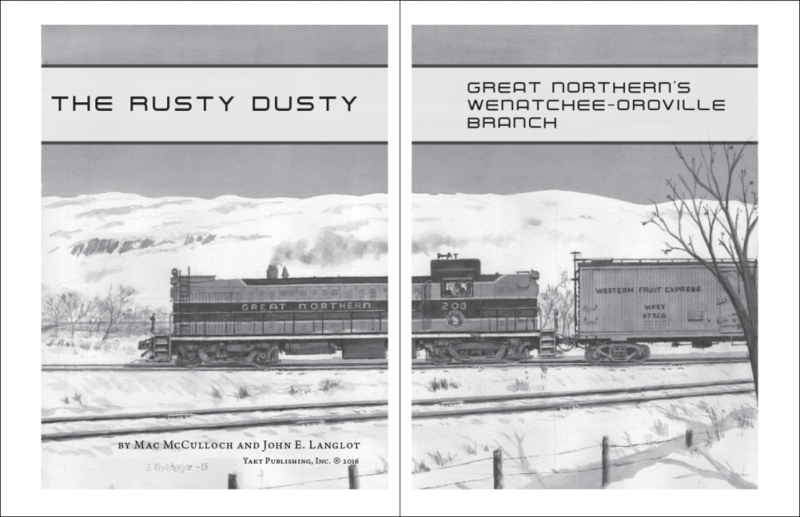 Another project from this past spring and summer was the design and production of The Rusty Dusty: Great Northern’s Wenatchee-Oroville Branch. The book looks beautiful! The publisher chose really nice white text stock so that the many images would reproduce well. 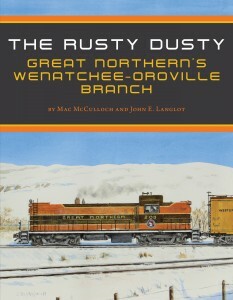 The book is a hardcover, with charcoal cloth and bright orange endpapers, to coordinate with the colors from the painting on the dust jacket. Endpapers are one of those really small details that can effortlessly add a layer of dynamism to a book—it instantly makes it look more special. Alco RS-2 number 203 has just entered the W–O line at Olds Junction on a winter afternoon in the early 1960s. 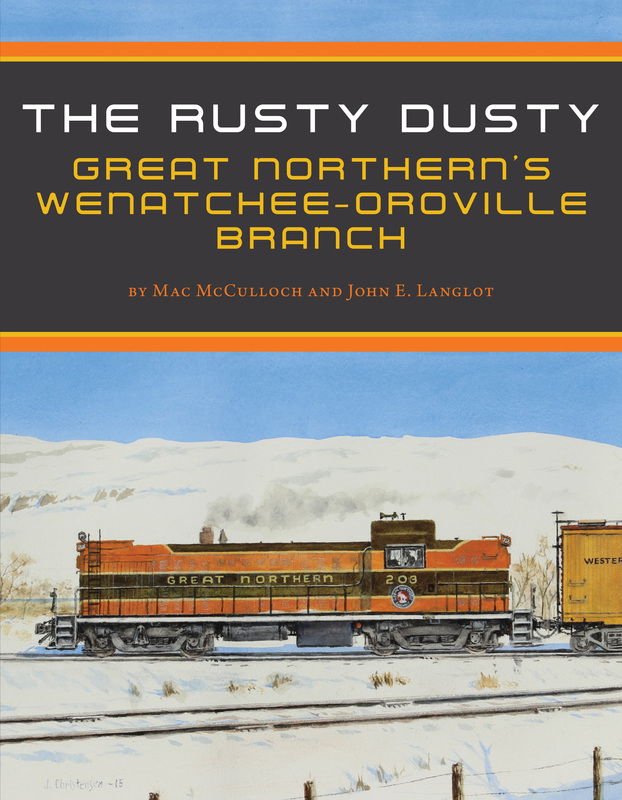 Head brakeman and co-author John Langlot has opened the switch and reboarded the engine. When the train is past the switch the rear brakeman will reline it for crossover movement and train No. 698 will be on its way to Oroville. Watercolor by retired NP/BN/BNSF locomotive engineer Jack Christensen. 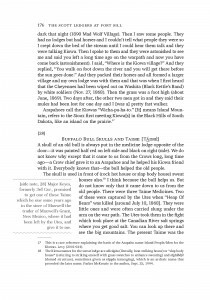 I spent a lot of the year working on (and the work on them continues, now that we have moved on to the design stage) an 1,100-page, two-volume set of legal documents related to the Mountain Meadows massacre, as well as an 800-page volume of records created during the Utah War. Never fear, though—I’m also finishing up work on a tiny little manuscript about a prospector; its entire length was the size of two chapters in my usual behemoths! A friend asked me to design some tickets for a set of concerts this winter. It was a fundraiser for a school called M.O.O.S.E., so naturally, we needed a large ungulate in the center! (M.O.O.S.E. stands for Magic of Oral and Signing Education. [I was being overly literal.]) Thankfully, my husband is a great photographer and had taken a series of moose photos the last time we visited Yellowstone, so I could comb through his files to choose just the right one. Since there was going to be more than one concert, the design needed to be consistent—thus the change in color. Why the unnatural colors? To be fun, because concerts are fun. As was putting together a project like this! (Note that I blurred out the address, as it was at my friend’s house.) The fundraiser was a huge success, and the concerts sold out very quickly. Hooray! In the last post, I talked about the cover image and how I’d initially planned to wrap it around to the back cover. One of the aspects of the new design is putting more emphasis on the great images that we run. 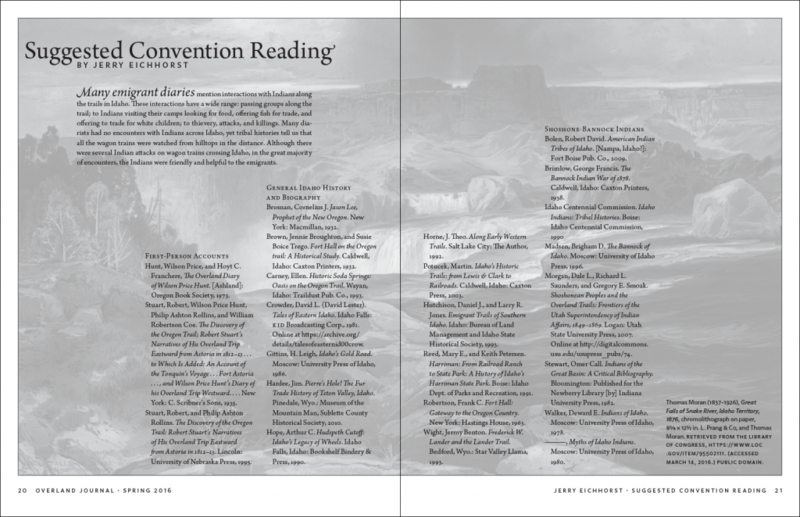 The reading list for the upcoming conference is a good example of that. Rather than just set a plain list, I put the full, glorious cover image across the two pages, then converted it to grayscale and screened it back so the text was still legible. It’s a fairly subtle effect, but it creates a sense of continuity with the cover and also means that readers do end up seeing the full image. This list of suggested reading uses the full image that we cropped on the cover. One thing that we are continuing from the previous design is the mailing wrap, with a quote from one of the articles. 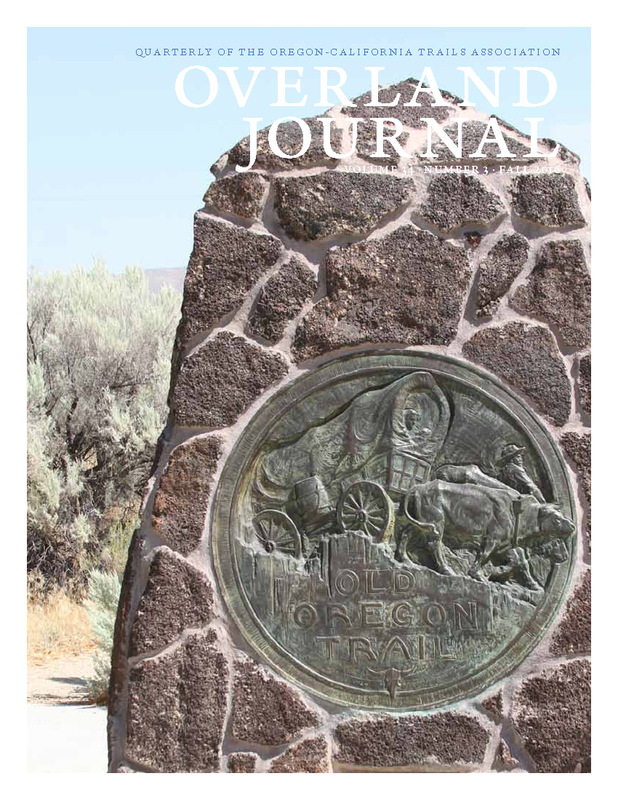 The one for this issue could not have been more perfect, as all of the articles are on the area around Fort Hall, which is on the Snake River. The mailing wrap is still the grayscale version of the cover, with a pithy quote from the text. 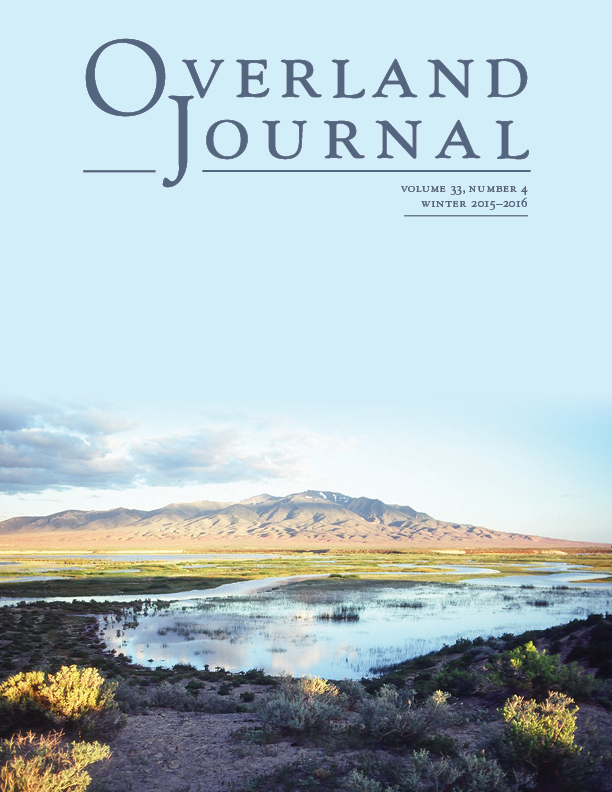 Overland Journal is getting a whole new look! Check out the new cover. 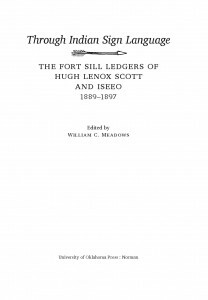 The issue is devoted to Fort Hall, in southeast Idaho, where the conference is being held in August. The cover image is a portion of Great Falls of Snake River, Idaho Territory, 1876, a chomolithograph by Thomas Moran. I chose it because of the bright, dramatic colors—the contrast in the river gives it so much motion—and grainy texture. The design of the cover now has a wide white border around the image, giving it the feel of holding a snapshot (how old fashioned!) in your hand. I wanted the striking images that we are so lucky to run to seem framed—they are artwork, after all. I had originally planned to wrap this around the front and back cover, but we ended up with an ad there. So I’ll use the full image (in black and white) elsewhere in the issue; I share a shot of it in a later post (once it gets approved by the editor). As always, the Library of Congress is a great resource. 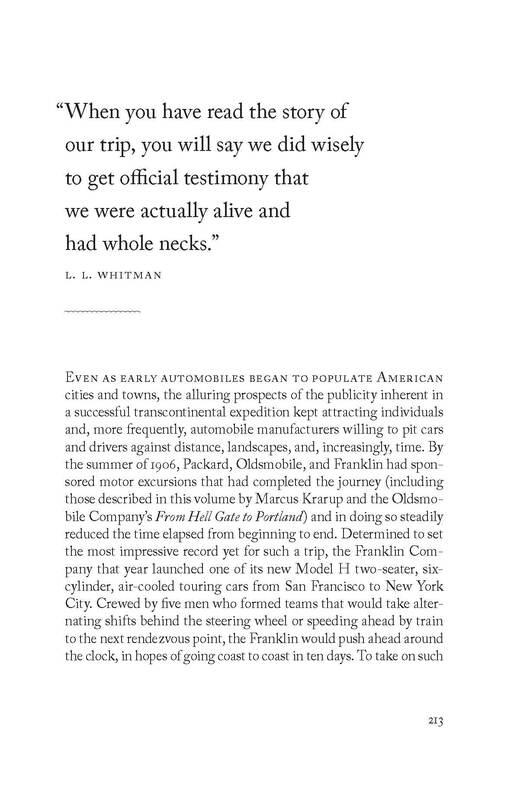 While rearranging the wall of books in my living room a few weeks ago, I remembered a project that I mentioned here but never revisited—Motoring West, volume 1, by Peter Blodgett (Arthur H. Clark Company, 2015). It is a compilation of accounts of the very first car trips west of the Mississippi. I was overjoyed to be the editor on this project—it was hilarious, and that is something that I rarely get to say, given my usual niche. A pure joy to work on! I was particularly proud of this book’s design, which plays up the pithy humor in this book by using short quotes as chapter openers. For the overall look, I had classic Arthur H. Clark style in mind: big, airy Caslon type, whose simple elegance lets the words shine. (The little rule underneath is a wink and a nod to the bumpy paths that the first motorists had to endure.) I’m so glad this book is just the first in a series, because it means working with Peter Blodgett—and this design—again! The cover is totally stunning! Here’s the caption on the image: Star Peak, at 9,863 feet, is the highest peak in the Humboldt Range in Pershing County, north-central Nevada. This view looks south toward the peak from the junction of the Applegate Trail and the Humboldt River Route. The water in the photo is Rye Patch Reservoir, fed by the Humboldt. The Applegate Trail goes through the northern part of the reservoir, constructed in the 1930s, where the trail separates from the Humboldt route. Photograph by Herman Zittel. Junípero Serra: California, Indians, and the Transformation of a Missionary (in the series Before Gold: California Under Spain and Mexico) has been selected in Choice Reviews Online Top 25 Academic Books of 2015! 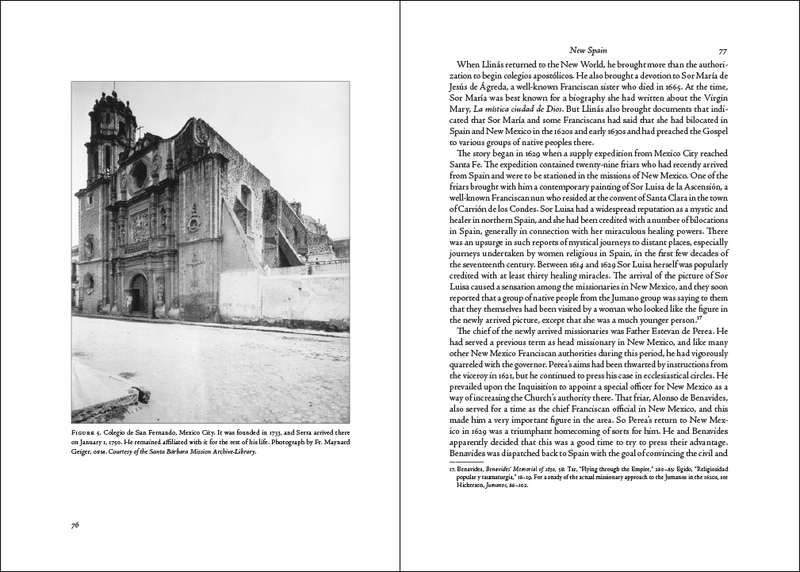 The book has gotten a lot of press this year, as it played a pivotal role in the canonization of Serra by Pope Francis last year. In fact, the authors, Rose Marie Beebe and Robert Senkewicz (two frequent collaborators), were flown to the Vatican and the book was added to the archives there! I am the designer on this series and this volume is a beauty: 7×10 with lots of color images. 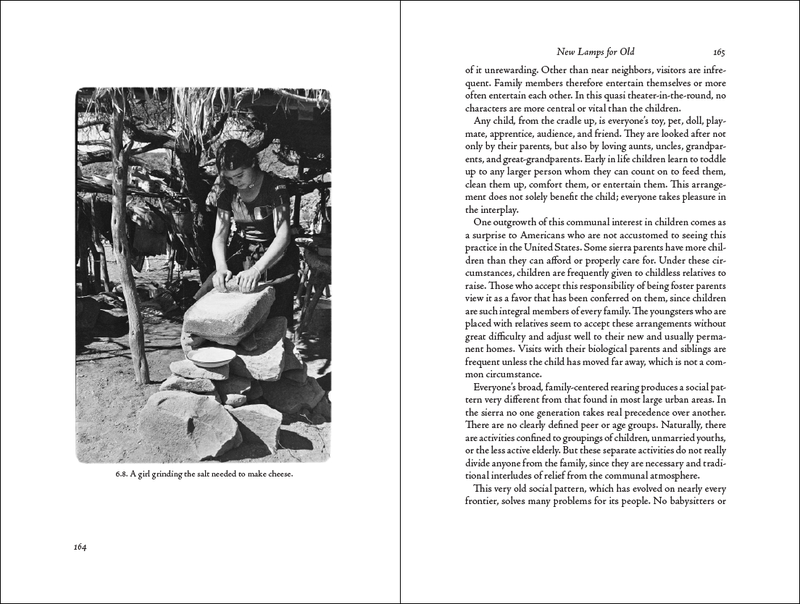 Here are some pages from a book in the same series, Californio Portraits: Baja California’s Vanishing Culture, by Harry W. Crosby. The photos in this book were taken in the late 1960s, and we decided to encourage that feel by leaving the images without a keyline and with the curved corners and rough film edges. At the Western History Association conference in Portland in October, I met up with Rose Marie and Bob and learned about their upcoming volume on Vallejo. It will be a very special addition to the series—not surprising given the ambitious authors, who are driven to do the very best!